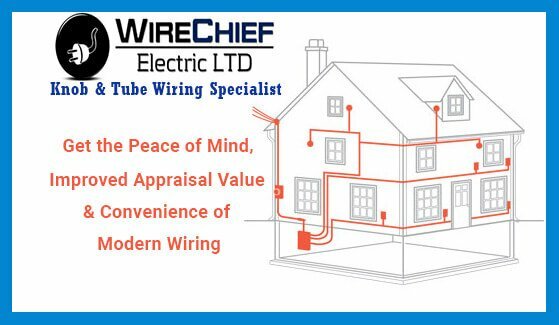 WireChief Electric Ltd. specializes in Knob & Tube Removal, Repairs & Safety Inspections in Vancouver, caring for your historic & stately homes with skill, respect, and expertise. When WireChief Electric completes a Knob & Tube Rewiring, the home has all the charm of its era and all the convenience and safety of a modern house. Our mission is to provide peace-of-mind and comfort through quality installations with family-like customer service. Our team of friendly & skilled Vancouver electricians is committed to helping you create the perfect place to come home to. Specialized yet Competitive Vancouver Knob & Tube Re-Wiring Services. Vancouver Electrician / Vancouver Electrical Contractor providing specialized yet competitive services to homeowners of knob and tube wired homes in the Greater Vancouver and surrounding areas. Replacing Knob & Tube wiring gives you the peace of mind, knowing your electrical system meets the modern electrical code for your home & family safety. WireChief Electric offers efficient & quality solutions for homes being sold or brought on condition. We pride ourselves in minimum cutting to your vintage home. We protect your furniture, decoration, and floor covering before we start working. We clean up at the end of every working day. We work continuously until the job is done and provide regular project status updates. We are here to help you – We care about you and care about your property. We are Friendly – We treat people with kindness and respect. Transparency – We do what is right and speak openly about timing and prices. Peace-of-Mind: We offer lifetime workmanship’s warranty. On Budget: We will honor the fixed price in your quote. Extras will be added only if you add work to the project scope, add upgrades during the project, or if something is uncovered during the Knob & Tube rewiring project that we could not have predicted in advance. Quality: We promise to provide the highest quality electrical service and workmanship in full compliance with the Canadian electrical code. Always in touch: During regular work hours, you can always reach us by email or phone. 1. Fire hazard caused by uncontained sparks from arcing. 2. Inadequate outlet power for today’s electrical devices and appliances. 3. Most home insurance companies in Vancouver want the Knob and Tube wiring either replaced or certified as safe and in good repair by a licensed electrician. 4. Electric shock a potential hazard with ungrounded outlets. 5. Unsafe wiring modifications made to the Knob & Tube wiring over time. Knob & Tube wiring in its original state is basically safe. The ESA consider this open wire system OK. However, the insulation for the wires of Knob &Tube is over 60 years old and is at the end of its usefulness. Today all fixtures and appliances require grounding for your safety, in view Knob & Tube has no bonding wire connected to the switches, lights, and receptacles. We suggest Knob & Tube should be replaced or removed. It’s frequently today that insurance companies refuse to insure, or are reluctant to renew insurance policies for homes with Knob & Tube wiring. For buyers of homes with Knob & Tube wiring, may find it very difficult to get insurance coverage. For the owners of homes with Knob & Tube wiring, it is best to replace it before putting your home on the market. You will get a significantly better price for your certified Knob and Tube free property. If you’d like to learn more about your system & investigate the possibility of rewiring your house, contact us for a no-obligation courtesy consultation. Having the peace of mind, knowing your electrical system meets the current Canadian electrical code for safety, goes a long way. When we have removed and replaced all of the Knob & Tube circuits in the house and city inspectors have inspected and approved that our work has been completed in accordance with the electrical code standards, we will provide you with a “Written Certification”. We also will provide a copy of the approved inspection. These certificates can be used as verification with the insurance companies guaranteeing the home meets the current Canadian Electrical Safety Code standards. When selling a vintage house these certifications will assure potential buyers and their insurers of the electrical wiring status of the house, thus producing the maximum market value yield for your property. Call us to discuss your needs at your convenience. We will give you a no-obligation quote. We will also give you a free verbal Electrical Audit for your home. We provide residential electrical services to Vancouver, North Vancouver, West Vancouver, Burnaby, New Westminster, Coquitlam, Port Coquitlam, Port Moody, Surrey, Delta, and Richmond.